Foreign language teaching at the university level has taken on importance and value over the last decade due to global competition between institutions of higher education. For this reason, language educators are faced with the challenge of looking for innovative teaching methods, which not only stimulate and motivate their students while encouraging language acquisition, but also add an intercultural dimension. This teaching note proposes to analyze the use and impact of cinematic resources (film and television series) as resource materials on English for Legal Purposes (ELP) classes designed to promote learner awareness of Anglo-Saxon professional legal culture. After an initial overview of the theoretical background, the article then provides a summary of the method, results and observations. This didactic approach can be applied to any foreign language or discipline such as medical studies, sociolinguistics, psychology, etc. L'enseignement des langues étrangères dans le supérieur a pris plus d'importance et de valeur au cours de la dernière décennie en raison de la croissance de la concurrence mondiale parmi les établissements universitaires. Pour cette raison, les enseignants de langues sont confrontés au défi de la recherche de methodes pédagogiques innovantes, qui peuvent stimuler et motiver leurs étudiants non seulement en encourageant l'acquisition de la langue, mais aussi en y ajoutant une dimension interculturelle. 1In 1947, J.E. Travis, Chair of the Modern Language Association of Great Britain, expressed the need for research to begin on the use of film in language teaching and learning. In his article, the author examined the limitations and potential for film use at a time when “film projection apparatus [was] costly and cumbersome.” Since that time, we have experienced a rapid evolution in technology and the use of audio visual materials in language teaching. As a result, there has been extensive research on the use of film in the language classroom. For example, Bardovi-Harlig et al. (1991) maintain that films can provide “pragmatically appropriate language samples” in unique social and cultural settings, while Lowe (2007) insists that “film is an optimum source for learners to acquire useful vocabulary.” Similarly Eken (2003) and Sweeting (2009 & 2010) have insisted on the advantages of film use while developing creative workshops and useful models for its integration into the language classroom. In terms of the visual dimension, film enhances the descriptive qualities of vocabulary and in this case legal jargon, through the use of body language, emotion and rich, visual courtroom drama and settings (Stone 2000). By placing language in context, the director uses film to bring language to life through the use of social norms, behavior and interaction, much like Shakespeare did with theatrical drama on the Elizabethan stage. 2The focus of this article is the implementation of video and film in a third year ELP (English for Legal Purposes) program and its evaluation. The theoretical foundation is principally based on the SLT (Situational Language Teaching) and Oral Approach, which has existed since the 1920s and 1930s when British applied linguists began developing the basis for a principles approach to methodology in language teaching (Richards & Rodgers 2001). 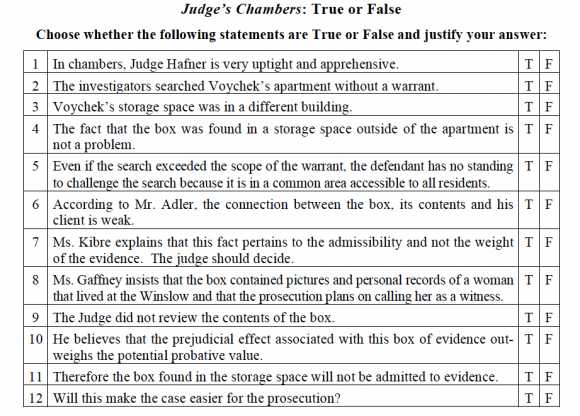 In this approach, emphasis is placed on vocabulary (legal terminology) as well as grammatical content (inside and outside the courtroom). Therefore, the language teaching approach involves an initial focus on spoken discourse in context through oral comprehension during the viewing process of the film and television series. The legal terminology is then presented in its written form, through the use of authentic materials, while referring to specific passages from the novel, in the case of the film. 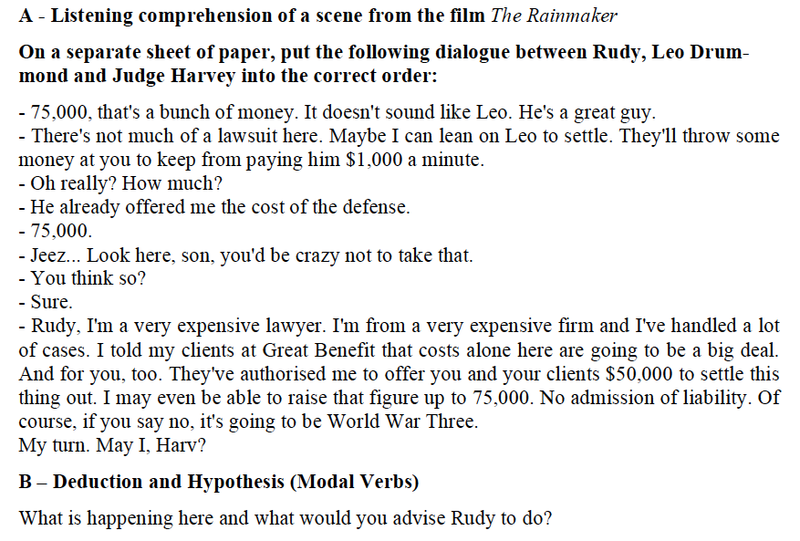 For this particular course, the film The Rainmaker (Coppola 1997) was chosen because it could be used in parallel with the novel of the same name, written by John Grisham (1995). The introduction and analysis of specific lexical and grammatical elements intervene only after the viewing and oral analysis of the film. 3The underlying principle and distinctive feature of this approach is that the knowledge of structures (grammatical and lexical) must be linked to situations in which they are used. This approach encourages language learners to develop fundamental behaviorist habit-learning skills, i.e. they are expected to deduce the meaning of a particular structure or vocabulary item from the situation or context in which it is presented. Generalization is thus the objective of this theory and global comprehension is encouraged with a focus on specific terminology introduced after the process of deduction. In this way, deduction strategies are encouraged, not only in the classroom, but also in the language center, where students are invited to view and analyze the film alone or in small groups. 4A variety of activities are integrated into the students’ workbook to encourage the development of analytical skills. Some of these exercises and activities include vocabulary building exercises (related word clusters), discourse organization, communicative interaction (role-play), organizational and study skills, as well as the synthesis of content materials and language in context. As White (2008) explains, the underlying objective of this approach is to focus on the needs of individual learners, not the interests of the teacher or an institution. White et al. (2007) maintain that decision-making strategies and approaches can be implemented to raise learners’ awareness and knowledge of themselves, from their learning needs and preferences to their personal beliefs and motivations in order to develop their learning strategies and language skills. 5Hence this pedagogical approach as well as the students’ workbook is inspired by CBI (Content-Based Instruction), which according to Richards & Rodgers (2001: 204-222) refers to a language teaching approach organized around the content or information that students will acquire, rather than, for example, the linguistic and grammatical elements. Krahnke (1987) explains that CBI is the teaching of content or information in the language being learned with little or no direct explicit effort to teach the language itself separately from the content being taught. Therefore, the language teaching activities include task-based teaching methods for instance, in the form of mock trial exercises, which are organized around the content and information the students will require in a legal professional setting. In addition, when creating the syllabus, the CEFR (short for Common European Framework of Reference for Languages, Council of Europe 2011) was taken into consideration in order to identify and integrate the various tasks, skills and language competency levels. 6In SLT, communicative competence is a key element and Hymes insisted that “linguistic theory needed to be seen as part of a more general theory incorporating communication and culture […] – what a speaker needs to know in order to be communicatively competent in a speech community” (1972: 269-293). Later on, Canale & Swain (1980) further developed this pedagogical approach by defining four dimensions of communicative competence: grammatical, sociolinguistic, discourse and strategic. This article deals with the sociolinguistic and strategic competences which refer to the understanding of the social context in which communication takes place, including role relationships, the shared information of the participants and the communicative purpose for their action. Strategic competence refers to coping strategies that communicators employ to initiate, terminate, maintain, repair and redirect communication (Canale & Swain 1980). Given that the course is meant for third year (L3) legal studies, it is quite fitting to place the emphasis primarily on both the sociolinguistic and strategic competences, followed by the discourse competence and finally grammatical competences. The reasoning behind this order and logic is that third year students should already possess the fundamental grammatical skills for language communication. 8This particular pedagogical approach requires that the teacher not only undertake to respect the above-mentioned roles, but also assume the role of needs analyst, counselor and group process manager, depending on the variety and scope of the various exercises and activities. 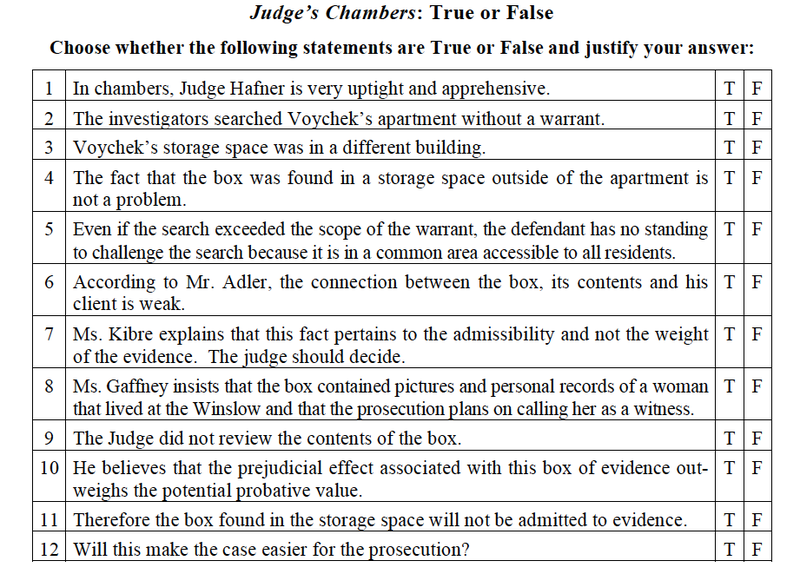 In the case of ELP, s/he must have some knowledge of courtroom drama, as well as a range of legal terminology (Bourdon 2006) to properly instruct law students. And finally, Isani (2006) illustrates the importance of awareness as a preliminary step leading to introspection and the analysis of one’s own behavior, beliefs and attitudes. It is very useful for teachers of ELP to encourage the development of this process of “awareness” and “introspection” with their students to better prepare them for their future careers. 9The following ELP pedagogical method is consequently the result of the aforementioned theoretical research. 10Test Group: Third Year Students of Law Studies. There were eight groups of Law students (a total of 360 students); however the author was responsible for only four groups (a total of 180 students). Two additional teachers taught the remaining four groups. All eight groups were heterogeneous and the competency levels ranged from A1 to C2. 11Duration: Program based on 1 semester (2 hour weekly class= 20 class hours). 12Objective: To develop oral/written comprehension and expression skills, with the objective of motivating students through the implementation of film and television series based on law and trial movies. 13Required Material: The film(s), the series and the book(s), a previously prepared students’ workbook (5-6 hours of teacher preparation, which includes exercises and questions for debate, as well as homework and comprehension evaluations (cf. Appendices I & II). A few useful resources for preparing the students’ workbook are the legal series of self-study books by Day (2006) and Krois-Lindner & Firth (2008), as well as Green (1987) for methods on communicative language testing. 14Audio Visual Equipment: a DVD player or laptop computer and overhead projection equipment. The 10-week session was divided in half. The first five weeks were dedicated to the film. The four subsequent weeks were spent on each of the two episodes chosen from the legal series, Law and Order (Green et al. 2005-2006; Strong et al. 2009). The tenth week was left open to finish up the course content or review and discuss comprehension issues. - Weeks 1-5: The film The Rainmaker (Directed by Francis Ford Coppola, 1997). - Weeks 7 & 8: Law and Order: UK Care, 2009 (Directed by Strong. J. et al. 2009). - Weeks 8 & 9: Law and Order: Trial by Jury (USA) episode entitled Eros in the Upper Eighties (Producers: Green, W. et al., 2005-2006). - Week 10: Review, Summary, Discussion and Debate, Course Evaluation. 16Five weeks are sufficient to view the chosen scenes and analyze the text passages from the book (which serve as reminders of the film scenes viewed in class when homework is assigned). 17In the next four weeks, a shift was made to the UK and then back to the USA, for a number of culture-related reasons: investigative methods, court proceedings (differences in dress codes and behavior), as well as accent and pronunciation. 18The last week was reserved for an overall review of the course, summary, discussion, debate and the course evaluation using an anonymous questionnaire. It was also an ideal time to review a few specific scenes from the film or the series. 19It should be noted that the process of scene and text selection respected intellectual property issues as the DVD supports were not copied, nor were the film, the series or the other textual documents used in their entirety. Scripts from the film and the television series were created by the author through the use of somewhat tedious but fruitful transcription methods. One personal advantage was that the author knew the script by heart before classes began. 20It should be noted that at the beginning of the course, 135 (75%) out of the 180 students stated that they had no fixed idea about their career choice and more than half had never set foot in a courtroom. The use of legal film and television series can thus provide students with an active immersion setting which places them in direct contact with the various ranks of the legal profession. It can also bring serious and ethical courtroom drama directly into the classroom. In addition, the use of a students’ workbook is also a practical way to provide a concise course outline for those students who may miss a session. This encourages the students to assume a certain level of responsibility with regards to their language learning (White 2008) outside the classroom. Another advantage is that students are fully aware of homework obligations, as well as class progression in the case of absence. 21With a vast array of legal films and series on the market, it was crucial to choose an appropriate film and episodes from television series which were fitting for this setting. 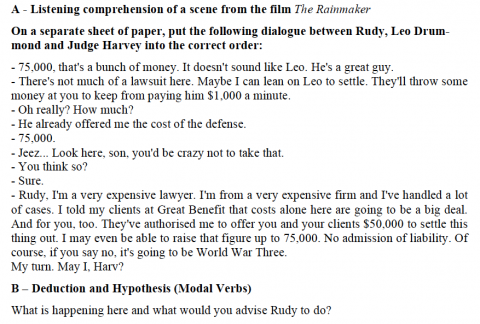 Elkins (2006) provides valuable insights into the choice of appropriate “lawyer films” as well as various approaches to film and text analysis. After previewing several of them, The Rainmaker was chosen because it corresponded to the needs of the learners. The film is replete with ethical issues both in and outside the court, which stimulate awareness, responsiveness and debates. Students can easily relate to and identify with the main character who is uncertain about his career choice. 22The Rainmaker is about an inexperienced lawyer, Rudy Baylor (played by Matt Damon), faced with the corruption and challenge associated with legal services in the heart of the USA. A story of David and Goliath, with many twists and turns, the film reaches its climax when Rudy manages to bring a major insurance company to its knees. 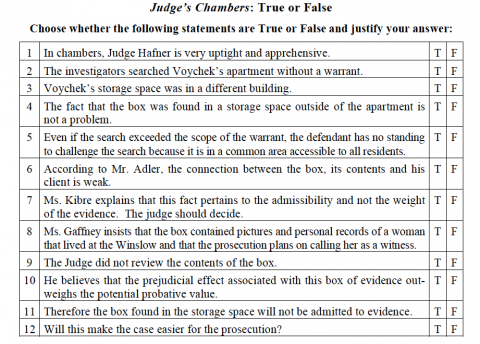 The plot, which explicitly details the stages of a court trial and the apparent corruption in the legal profession, allows for in-depth analysis. In this film, students are presented with a clear model of courtroom drama. 24It also includes the analyses of all the people directly involved in a lawsuit of this type. negotiating with defense lawyers, as well as presenting closing arguments. 26The Law and Order (UK) episode entitled “Care” is a very moving episode where a very young widowed British mother is faced with the accidental death of her infant baby, only to be accused of murder. The courtroom drama is quite poignant as her lawyer justly describes and presents her as the second victim (her infant baby being the first one). 27The other Law and Order episode “Eros in the Upper Eighties” was chosen from the Law and Order: Trial by Jury series. It is set in New York City, providing a contrast in culture and exposure to an American English accent. It not only reinforces the dimension of jury selection and mock trial use by the defense lawyer, but it also provides an unexpected distortion of reality. In this case, an overzealous doorman ‘rescues’ a woman from the hands of a vagabond, who is killed in the struggle. As investigators search for evidence, they uncover the harsh reality that the doorman was in fact stalking the woman. A complicated trial ensues where the virtuosity and kindness of one individual, the doorman, is not perceived the same way by the others. At the outcome of the trial, we learn that the victim is only protected for a brief period of time because the accused doorman manages a plea bargain for a reduced incarceration period. 28In the case of The Rainmaker, a typical class would consist of several exercises based on the oral comprehension of a scene. Three viewings are provided, without subtitles, but after the second one, a brief discussion and summary are introduced. This serves as a quick comprehension quiz. Syntax and grammar (Verbs, modals, adverbs, comparatives/superlatives, articles, etc.). 30Almost every film scene viewed in class is reflected in the workbook. The same passages from the book written by John Grisham (1995) are used. The passages are read at the beginning of the each class to refresh memory, correct exercises orally and review the vocabulary. 31Much debate resulted from the comparisons and contrasts between the film (scene depictions, use of zoom lenses and the musical score, close-ups of witnesses, jurors, etc.) and the written word. Since the film and two episodes are available for autonomous learning and viewing in the language center, students are encouraged to watch the scenes again between classes. They are then given the opportunity to rework the exercises and improve comprehension. Additionally, they are able to review the scenes for subtle details (settings, costume and dress codes, gestures, accents, etc.) that may have been missed during the in-class viewing. Students are also encouraged to read the novel in its entirety and watch the whole film independently over the course of the semester for improved overall comprehension. 32After correction and a comprehension quiz, students are then provided with a fourth viewing to complete and further enhance the learning process. To develop a specific point such as the comprehension of contingent fees, tort reform and bankruptcy, additional documents or articles are occasionally included, discussed, read aloud or assigned as homework reading, depending on time constraints. 33The students were initially quite reticent, due to the Southern, Memphis (Tennessee) accent and verbal intonation of the characters. Nevertheless, they quickly learned to overcome these concerns and appreciate the overall intent of this course – to improve written and oral language skills, while focusing on legal terminology in a motivational setting through the use of modern film and television series. murder investigations from the perspective of a number of different legal professions. 35A variety of vocabulary exercises and instructional activities brought the learning material to life through debates, game show questioning (Cooper 1994) and mock trials, to name a few. 36On the very first day of class, the author discovered that only a handful of the students had previously seen the film, read or heard of the book. However, from the very beginning, responsiveness was very positive as students were willing to ask questions, inquire about vocabulary or expressions and participate actively in class discussions regarding the differences between French Civil Law and Common Law. Through their actions, such as volunteering responses, as well as reading, students showed increased fluency even if the oral expression was not automatically in English for some. Due to time constraints, some of the homework exercises were transformed into oral classroom evaluations. 37In terms of the CEFR, the groups were heterogeneous at the onset with students ranging from A1 to C2 levels in terms of reading, listening, speaking and writing. The integration of language portfolios and auto-evaluation would have been very useful to chart individual progress during the semester and encourage independent evaluation in this type of learning environment. 38With regard to the anonymous course evaluations, which were distributed to the author’s four groups at the end of the course, the results proved to be quite revealing on a few important points. Students felt that the course program was of great interest (95% or 171 students) and useful (85% or 153 students). They appreciated the oral comprehension and expression; however, they understood that due to the class size, written expression could not take place as often as they would have liked (65% or 117 students). From the perspective of class instruction, the size of the groups was not a problem in terms of teaching and learning, but it was a great challenge in terms of personal one-on-one attention for oral and particularly for written evaluation. Since 180 papers to correct for these four classes each week would have been an unrealistic workload for the teacher, the only solution was to randomly accept 10 to 15 written expression papers of approximately 200 words per group per week on a rotating basis. 39Two sets of the film and the series were purchased and one was left at the language centre for student access and independent consultation. According to the questionnaire, most students (80% or 144 students) made arrangements to watch the entire film and series episodes outside classroom activities. Many students (68% or 122 students) used the English subtitles (which the author did not use in class as she felt they could lead to distraction) during their private outside-the-classroom viewing. In so far as the book was concerned, more than half preferred to purchase a second-hand copy of the book (approximately 65% or 117 students). Some motivated students (about 25% or 45 students) bought both the book and the film. In the case of the Law and Order series, it was somewhat more complicated since the whole season had to be purchased (the price is relatively high) and the series was already quite rare and difficult to find. 40When asked if the instructor played an integral role in terms of motivation and impact on student participation, roughly 46% or 82 students agreed ‘strongly’. 38% or 68 students indicated that the course had had a ‘very positive impact’ on their future career choice and a large majority (85% or 153 students) claimed to have learned ‘a substantial amount of information’ about the legal profession in the USA and the UK. 41In this teaching program, students were given an opportunity to delve into the study of civilization through the comparison of British and American law customs and cultures, which also highlighted the differences between pronunciation and accent. The students also provided insight into French Civil Law and thus formulated comparative opinions. The resulting debates created a motivating ‘reciprocal learning’ process whereby students were actively encouraged to share their legal knowledge with the language teacher. 42Nevertheless, when comparing and contrasting different legal cultures in this way, one must take every precaution to avoid falling into clichés and stereotypes. It is also very important to carefully select the film and consider whether or not it is appropriate for viewing in this setting. The author chose to focus on the main story line and left the students to discover the subplot during their independent viewing and learning stages. 44The language educator is highly solicited by the students to provide explanations and solutions to comprehension issues. This is both positive and negative since the students are clearly showing a marked interest in the program; however, given the number of students, it is sometimes difficult to address individual concerns. 45Legal studies do not merely involve the study of terminology and due process, but also the reflection on society, culture and politics. Elkins (2006) insists that viewing a film is, in itself, an education since the film tells a story and exposes the viewer to drama as well as conflict. It also provides the viewer with heroes and characters with which they can identify. The use of compelling representations of lawyers in action is a natural approach to language teaching. Many students learn a large part of their foreign language proficiency and vocabulary from film, television series (target language), as well as video and online virtual games. Films are means of bringing language immersion into the ESP and ELP classroom. Therefore, this ELP didactic approach is a valid and viable solution for the integration of film and television series into ELP teaching. 46This ELP approach is very much a hands-on experience and requires a lot of attention on the part of the teacher who must mediate between the video support and the students. At the same time, the teacher needs to ensure that the majority of the class is following in terms of comprehension. The teacher must be able to shift between roles to accommodate the student needs and proficiency levels. Assigning homework was somewhat risky in that many of the students gave priority to their legal classes and very little priority was given to English classes. For this reason, some of the homework assignments were transformed into in-class oral or written evaluations. 47Furthermore, this same method of integrating film and television series into language teaching can be used for trans-disciplinary purposes and applied to any language class (ESP, ESL, Spanish, German or any other language) in varying disciplines, from Law, Health and Medicine to Economy and Business, as well as general English courses. It can also be easily integrated into a distance learning program1. 48As teachers, we have an ongoing responsibility to formatively assess and update our teaching approaches and strategies to reflect the changing times and use of technology. We are very fortunate to have such a wide variety of ESP/ELP resources available to us today. Film and television series provide the perfect setting for students to venture into the professional world and learn the appropriate language in a virtual and natural setting. Since learner engagement is a priority [for a successful teaching and learning environment] (Richards & Rodgers 2001), where teaching is a pleasure, students are taught the pleasure of learning. I would like to thank the editors and the anonymous referees for their helpful suggestions. It goes without saying that they are in no way responsible for any shortcomings which may remain. Bardovi-Harlig, K. et al. 1991. « Developing pragmatic awareness: closing the conversation ». ELT Journal 45(1): 4-15. Bourdon, M. 2006. « De l’utilisation du cinéma en anglais de spécialité Carrières juridiques ». Les Cahiers de l’APLIUT, vol. XXV, n° 1: 108–111. Breen, M. & C.N. Candlin. 1980. « The essentials of a communicative curriculum in language teaching ». Applied Linguistics 1(2): 89-112. Canale, M. & M. Swain. 1980. « Theoretical bases of communicative approaches to second language teaching and testing ». Applied Linguistics 1(1): 1- 47.
Cooper, R. et al. 1994. « Film, TV and videotapes ». Les après-midi de LAIRDIL, Conference Proceedings n° 3. Council of Europe. 2011. Common European Framework of Reference for Languages: Learning, Teaching, Assessment. Strasbourg: Council of Europe Publishing. Day, J. 2006. Introduction to international legal English: a course for classroom or self-study use. Cambridge: Cambridge University Press. Eken, A.N. 2003. « You’ve got mail: a film workshop ». ELT Journal 57(1): 1-59. Elkins, J. 2006. 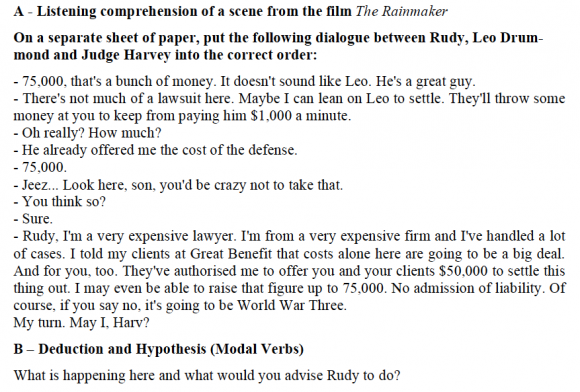 « Reading lawyer films ». Les Cahiers de l’APLIUT, vol. XXV, n° 1: 8–25. Green, P. 1987. Communicative language testing: a resource book for teacher trainers. Strasbourg: Council of Europe. Grisham, J. 1995. The Rainmaker. New York: Doubleday. Hymes, D. 1972. « On communicative competence ». In Pride, J.B. & J. Holmes (eds.). Sociolinguistics. Harmondsworth: Penguin, 269-293. Isani, S. 2006. « Revisiting cinematic FASP and English for legal purposes in a self-learning environment ». Les Cahiers de l’APLIUT, vol. XXV, n° 1: 26-38. Krahnke, K. 1987. Approaches to Syllabus Design for Foreign Language Teaching. New York: Prentice Hall. Krois-Lindner, A. & M. Firth. 2008. Introduction to international legal English: a course for classroom or self-study use. Student’s book. Cambridge: Cambridge University Press. Lowe, M. 2007. « Films in English Language Teaching ». IH Journal Issue 23, Autumn 2007: 16-19. Richards, J.C. & T.S. Rodgers. 2001. Approaches and methods in language teaching. Cambridge: Cambridge University Press. Stone, A. 2000. « Teaching film at Harvard Law School ». Legal Studies Forum 24: 574. Sweeting, A. 2009. Language Through Film. Sydney: Phoenix Education. Sweeting, A. 2010. « Film-based activities to overcome the ‘Gap-fill Syndrome’« . EA Journal 25(2): 51-57. Travis, J.E. 1947. « The Use of the Film in Language Teaching and Learning’« . ELT Journal, vol. 1(6): 145-149. White, C. 2008. « Language Learning Strategies in Independent Language Learning: An Overview ». In Lewis, T.W. & M.S. Hurd (Eds.) Language Learning Strategies in Independent Settings. Clevedon, England: Multilingual Matters, 3-24. White, C., K. Schramm & A.U. Chamot. 2007. « Research methodology ». In Cohen, A.D. & E. Macaro (eds.). Language learner strategies: 30 years of research and practice. Oxford: Oxford University Press. Coppola, F.F. (dir.) 1997. The Rainmaker. Hollywood, CA: Paramount Pictures. Green, W., P. Jankowski & D. Wolf. (prods.). 2005-2006. Law and Order: Trial by Jury, Eros in the Upper Eighties. Universal City, CA: Universal Studios. Strong. J. et al. (dirs.). 2009. Law and Order: UK Care. London, UK: Kudos Film & Televison, Wolf Films and Universal Studios. 1 To learn more about or share research on film integration into language teaching, language educators can contact Film In Language Teaching (FILTA), a plurilingual group available at http://www.filta.org.uk/. Dana Di Pardo Léon-Henri, « Teaching Foreign Languages through the Analysis of Film and Television Series: English for Legal Purposes », Recherche et pratiques pédagogiques en langues de spécialité, Vol. XXXI N° 2 | 2012, 126-139. Dana Di Pardo Leon-Henri, docteur en Langues Étrangères Appliquées (Commerce international et Europe) est enseignant-chercheur d’anglais de spécialité (droit, commerce international, finance, médicine). Elle mène des recherches sur la didactique des langues de spécialité, l’utilisation des documents authentiques et des films et des séries télévisées, au sein de l’équipe de recherche CATI (Cultures anglophones et technologies de l’information, EA 2566) à l’Université Paris-Sorbonne Paris IV.